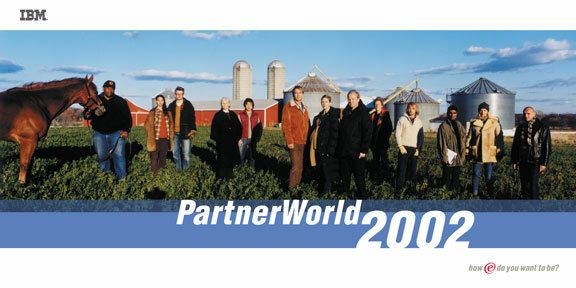 While I was head and creative director for Ogilvy & Mather’s Brand Integration Group (BIG) in Los Angeles, Chris Wall and I led the 360 branding for IBM Partnerworld 2002 including visual identity, print and outdoor advertising campaign, event experience design, website, publications and brand guidelines for all third party vendors. IBM Partnerworld is IBM’s largest annual conference and a yearly gathering of its global partners, resellers, customers, and developers. 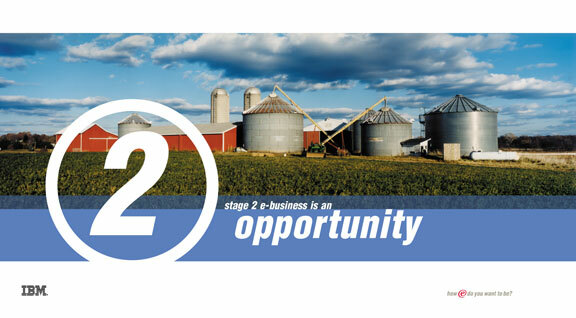 BIG was asked to create a look and feel for the conference that would strategically and graphically convey 2002 as a turning point in the evolution of e-business. The strategy that was developed defined the there of Partnerworld 2002 in terms of early integrating and advanced ‘stages’ of e-business and challenged attendees to answer for themselves: How ‘e’ do you want to be?. My core creative team included designers Simon Johnston and John Kieselhorst. IBM Partnerworld 2002 Outdoor Advertising (billboard).